Cesar Chavez Public Charter School | Transportation & Location: Cesar Chavez Public Charter School for Public Policy - Capitol Hill Campus is located in Capitol Hill between G and H Streets SE. The nearest public transit to Cesar Chavez Public Charter School is the Potomac Ave Metro Station on the Blue, Orange, and Silver Lines. The closest grocery store to Cesar Chavez Public Charter School is the Harris Teeter at 1350 Potomac Ave SE. Students and their families find themselves near Eastern Market, The US Capitol, The Library of Congress, Barracks Row, Yards Park and The Nationals Ballpark. Nothing like this on the market! Only 1.5 blocks to Barracks Row, this pristine property was completely redeveloped in 2017 and consists of 12 units, totaling approx 7,635 rentable SF on a 5,298 SF lot. The finishes are condo level and building is fully leased. Sale includes secure bike storage system & 4 surface parking spaces. An ideal reliable & stable investment opportunity, especially for a 1031 Exchange buyer. See COSTAR/LOOPNET listing for more pictures. Contact Mac Realty Advisors for offering memorandum. This is a one of a kind opportunity in Capitol Hill steps from the US Capitol Building. The building includes 15 units and is completely vacant therefore is not subject to TOPA. This is an excellent opportunity for the right investor. Cesar Chavez Public Charter School | Neighborhood & Real Estate Information: Cesar Chavez Public Charter School Capitol Hill High School is located in the Capitol Hill neighborhood. There are certainly a number of condominium options available in Capitol Hill, but the neighborhood is dominated by beautiful rowhouses. Real Estate has typically grown less expensive, the farther one gets from the Capitol Building, but this is changing due to the new life being breathed into the neighborhood. The neighborhood's main drags for commerce and leisure are Barracks Row (8th St SE) and Pennsylvania Ave SE which meet just south of the beloved Eastern Market. Cesar Chavez Public Charter School | Additional Information: Also known as Cesar Chavez PCS, Cesar Chavez Capitol Hill High School, Chavez Public Charter School,Chavez Public Charter School for Public Policy, Chavez PCS DC. 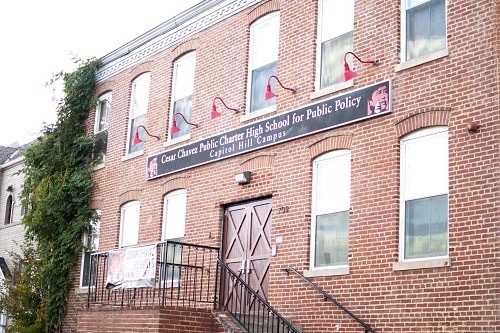 Cezar Chavez Public Charter School Capitol Hill High School is located at 709 12th St SE, Washington DC, 20003.